So you have finally decided that you want to start implementing changes to move towards a more sustainable, healthier lifestyle. One of the best ways that you can begin is by examining the health and beauty products that you use on a daily basis. It is incredible that we often don’t even know what we are actually putting in our bodies. When is the last time you picked up your tube of toothpaste and actually looked at the ingredients or even been able to understand them all? If you are anything like I was, the list of chemicals and how they impact your body will come as a shock. Though you don’t purposely ingest toothpaste, it is inevitable that some of it will make its way into your system. Here are a few reasons why you should switch to homemade toothpaste and recipes to get you started. What is hiding in your toothpaste? Triclosan: This is an antimicrobial agent that is added to numerous health and home products to prevent the spread of infection and fight off bacterial diseases. Unfortunately, it is also responsible for a number of health conditions including weakening heart muscles, increasing hormone problems and allergies. Even worse, there is no evidence to prove that it is even effective in eliminating bacteria. Propylene glycol: Would you fill your mouth with antifreeze? 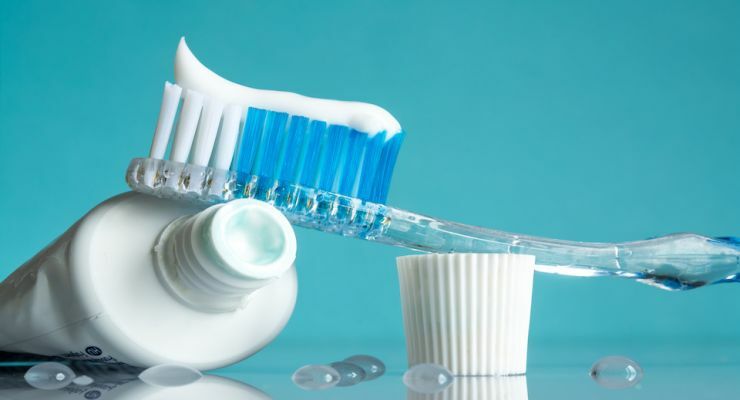 When you use toothpaste that has propylene glycol in it, you are brushing your teeth with something containing one of the key ingredients of antifreeze. Flouride: Wait, don’t dentists specifically use fluoride to prevent cavities and encourage oral health? Isn’t it a good thing when toothpaste tubes advertise “with fluoride?” In reality, most of the research surrounding fluoride use is outdated and is not backed up by more modern studies. Artificial coloring and flavoring: News flash, that bright blue color of your toothpaste isn’t exactly natural. Most toothpaste is filled with artificial coloring and flavor to make brushing your teeth more appealing. However, various food coloring has been linked to cancer, skin irritation, and even behavioral problems. If those toxic and just plain unnecessary ingredients don’t convince you, making your own toothpaste at home can save you money and help eliminate waste from your life. Here are three super simple recipes that you can try today! This super simple toothpaste is an excellent option for transitioning from classic, store-bought stuff. Mix the coconut oil, sea salt, and clay, and liquid stevia (if using) in a small bowl, using the back of a spoon to cream the ingredients together without stirring. Add 1 tbsp water at a time until the desired consistency is reached. Mix in the essential oil. Feel free to experiment with different essential oils to change the flavor of your toothpaste. Store in an airtight container or squeeze bottle. It can be hard to get your kids to brush their teeth no matter what. This cacao toothpaste will have your little ones running for the sink. Plus, it’s totally chemical free, so you don’t have to worry about their health when they accidentally swallow a little. Cacao powder is loaded with various nutrients and will leave your teeth feeling soft and clean since it acts as a gentle abrasive. Mix all ingredients in a bowl. You may need to use the back or a spoon or a fork in order to mix properly. Add a tsp of water, if needed to reach the desired consistency. Store in a squeezable bottle for ease of use! This toothpaste can help remineralize your teeth and strengthen them. Transfer to a container and enjoy! Have you ever made your own homemade toothpaste? Let us know in the comments below! Hey Buddy!, I found this information for you: "Make Your Own Toothpaste 3 Ways". Here is the website link: https://www.tropicalhealth.com/make-toothpaste-ways/. Thank you.